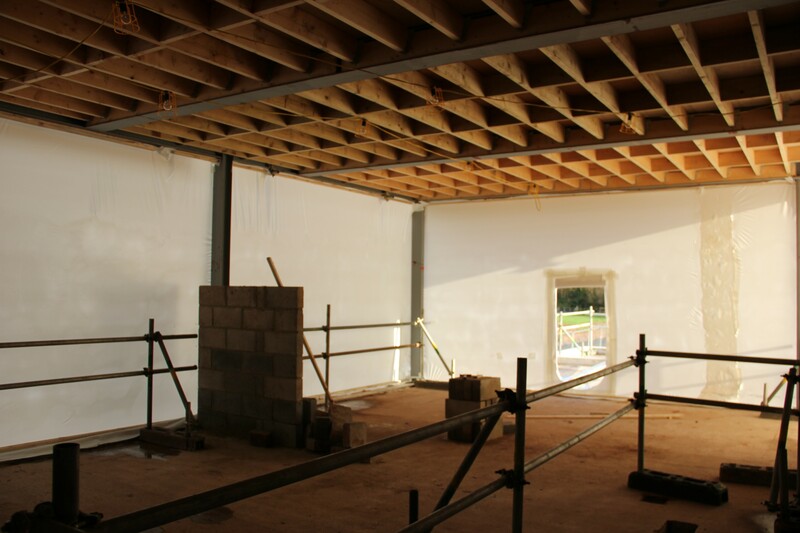 Weather Protection For Concrete Frame Building, Staffordshire. After a generally quiet and settled period of weather in September and October of 2015, November saw the first of several autumn storms bringing wind and rain across the North of England including storm Abigail, storm Barney and storm Clodagh. 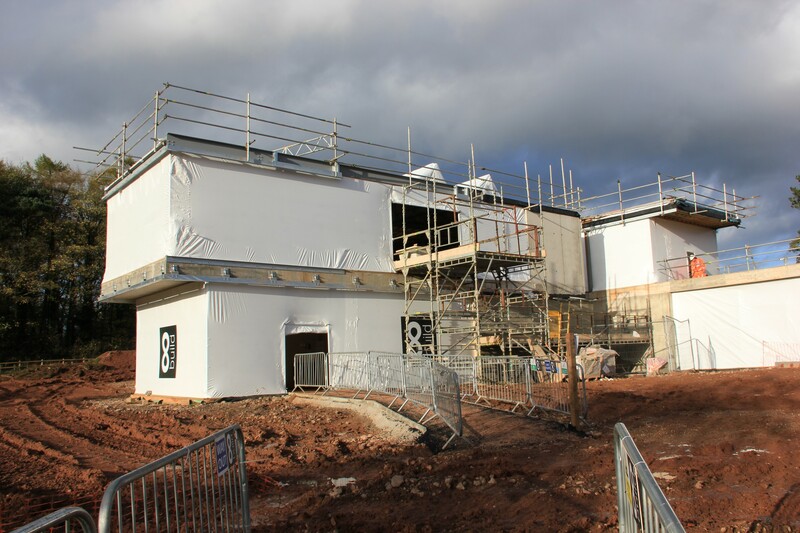 It was during this time that Robert Miceli of A&A Scaffolding approached Rhino Shrink Wrap to provide temporary weather protection around a ‘Grand Design’ type concrete frame home under construction in the heart of the Staffordshire countryside. The home is being constructed by a London based main contractor called 8Build who specialise in bespoke solutions for refurbishment and new build projects. Whilst the main concrete frame structure of the building was complete, large glass panels which make up a large part of the building exterior were not due to be on site for a number of months which left the site open to the winter elements. Steve Irlam of Rhino Shrink Wrap met with contracts managers from 8 Build and A & A Scaffolding on site in the Staffordshire countryside to formulate a plan. 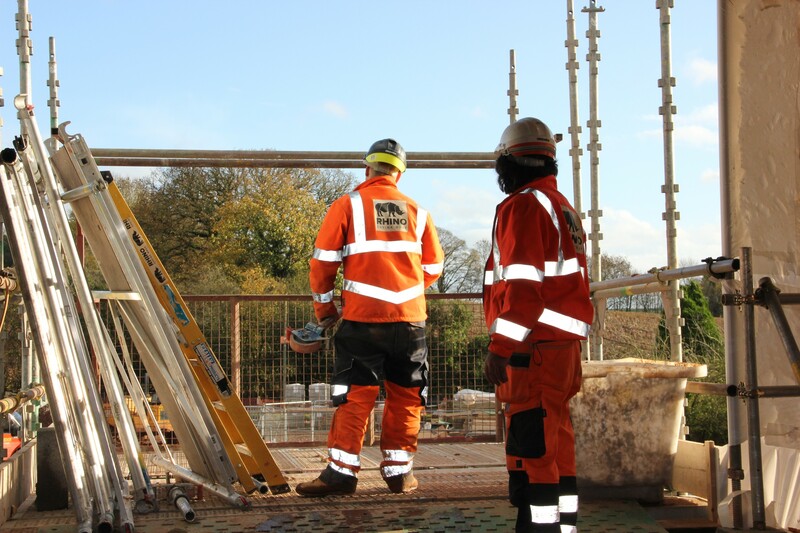 After the site visit it was clear to Steve that it would be possible to apply the shrink wrap sheeting directly to the concrete frame without requiring a scaffolding structure to be erected around the building – which would save considerable time and cost. At Rhino, when we fix our heat shrunk temporary weather protection sheeting directly to the external elevations of a building, we refer to it a shrink wrap ‘building screen’. Although we have installed shrink wrap building screens to create temporary weather protection around RC frame buildings for a number of main contractors in Central London, this was the first time we had erected a building screen around a private home but the installation methods were very similar. First, our installation team installed a wooden batten ‘picture frame’ close to the edge of the concrete slab, along the floor, ceiling (& sides where the concrete frame was split into bays). We used a Hilti concrete screw to ensure that the picture frame could withstand the wind loadings that would be applied to the shrink wrap sheeting in even the most extreme weather conditions. A challenging aspect of this project was the number of returns / corners in the building facade. Due to the design of the building, which incorporates large areas of glass walling and concrete slab floors which appear to ‘float’ over one another, at many corners there was nothing to wrap the shrink wrap around or provide an anchoring point. The solution was to use screw jacks which were inserted and screwed up between the concrete to form corners for the sheeting to wrap around. Once the wooden batten and screw jack corner posts were installed we used a Rhino 300 micron thick shrink wrap film to begin to start the process of wrapping the reinforced concrete frame facade. The shrink wrap is secured to the picture frame by using an additional wooden batten. Although shrink wrap rolls are available in a variety of widths, at 300 microns thickness, which is typically the thickest grade of sheeting used for scaffold wrapping, we use 7 metre wide x 15 metre long shrink wrap rolls. This size of roll is convenient to handle and still enables up to 100 square metres to be covered per roll. Unlike traditional scaffold sheeting products, the size of the roll is not always critical. This is because shrink wrap sheeting can easily be joined by overlapping two sections (typically by around 30cm) and using the hot air gun to heat weld them together. Once completed, this weld or join will be the same strength as the original material. Once the shrink wrap building screen has been anchored, and any overlapping sections have been welded / joined, the Rhino Shrink Wrap installation team used a hand held propane gas hot air gun to blow hot air over the surface of the sheeting which causes a bi-axial shrink process to take place. This process is a little bit like spray painting with hot air, the installer heats an area of the sheeting and watches as the shrink wrap sheeting contracts before gradually moving on. This heat shrink process is powerful and rapid with a single operator able to shrink many hundreds of square metres in a single day depending on the weather conditions. Why not watch a video of the heat shrink process? One of the benefits of using shrink wrap sheeting for temporary weather protection on construction sites is that it is possible to allow points of access through the sheeting whilst maintaining the weather protection (and/or dust containment). These zipped access doors are straightforward to install. For this project we mostly used a number of our 1.8m high ‘U’ shaped ‘step thru’ zipper doors, however, for locations on the site such as loading bays, where large equipment and materials needed to be moved inside the building, we used a 2.4m high, straight, self adhesive zipper. Once installed at the desired width, these create a much larger door which can be completely rolled up out of the way. 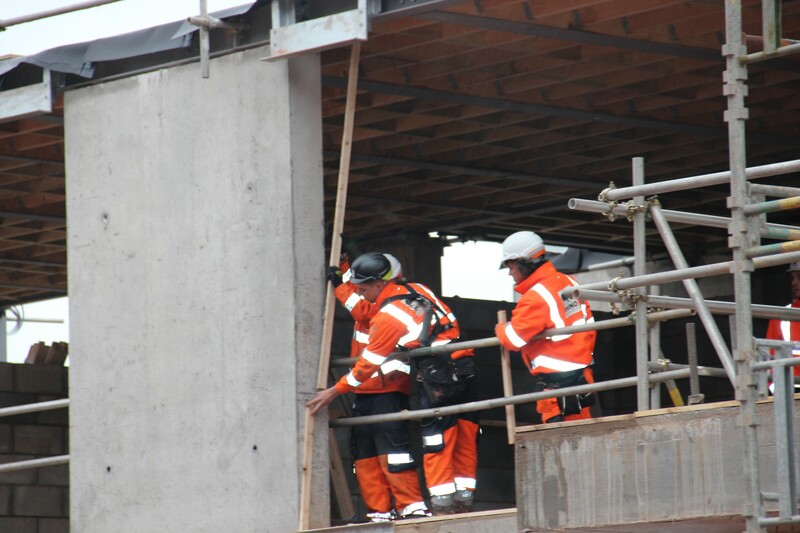 Since the building screens have been installed, the contractor has been able to make rapid progress on many aspects of the interior building work which would not have been possible until the glass panels that make up much of the facade had been installed. The shrink wrap sheeting still allows plenty of natural light inside the building (it is even possible to use a clear shrink wrap film.) Once the building was watertight, heaters were used to assist with the drying out process. In addition, the shrink wrap building screens presented a smart and professional appearance to the client for this high end project and provided an excellent canvas for the contractor’s logo and branding. Heat sealed joints between sheets created a completely encapsulated building. Smart appearance for a high end project. Allows lots of light through the sheeting for workers within. 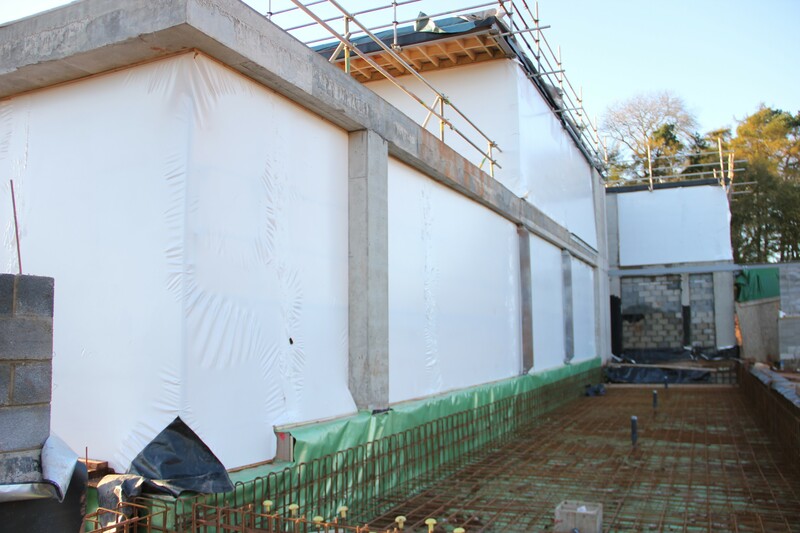 This small case study is just one small example of how shrink wrap sheeting can be used to create an extremely robust temporary weather protection or environmental containment around a reinforced concrete frame building. You can watch a short video of building screens being installed in Central London or please get in touch with us with any questions you might have. We look forward to talking with you.